It is important for a business executive or a salesman to develop the habit of maintaining their exercise program, even while traveling. This can be done by planning one’s business trip in advance to accommodate time and space for exercise. Exercising regularly is important to stay in good health and shape. However, for people who have a job that necessitates constant travel, exercise schedules suffer. This in turn affects their health and well-being. Also, while traveling one normally omits good eating habits and may indulge in gaining some extra calories. It is important for a business executive or a salesman to develop the habit of maintaining their exercise program, even while traveling. This can be done by planning one’s business trip in advance to accommodate time and space for exercise. 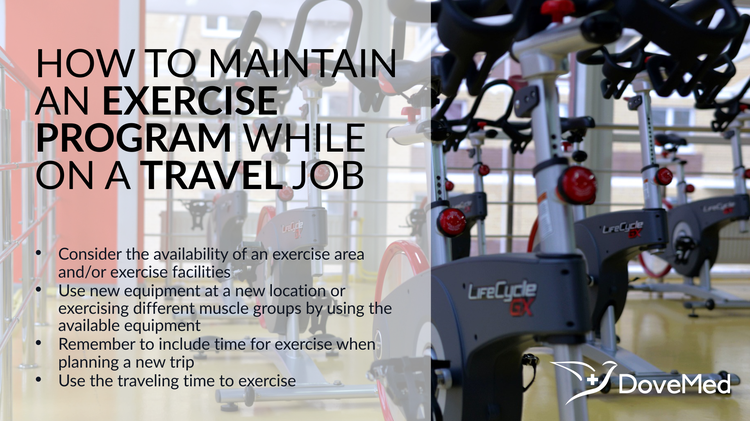 When selecting a place to stay, one should consider the availability of an exercise area and/or exercise facilities. Hotels in urban areas may not allow for a morning run. In such cases, one can request the hotel staff for suggestions. If there is no safe running route near the hotel, alternatives such as the treadmill may be explored. Certain hotels offer facilities like weight training equipment, cardiovascular conditioning equipment, and a swimming pool. Alternatively, a hotel or a lodging facility may have an agreement with an athletic club that allows guests to use the facility. Using new equipment at a new location or exercising different muscle groups by using the available equipment may tend to cause muscle soreness. To prevent this, one can reduce the intensity and duration of exercise while traveling. Small pieces of exercise equipment such as resistance bands or a jump rope can be packed into one’s suitcase. Other things that are advisable to carry are athletic shoes, exercise clothes, hand grips, music and headphones, swimming costume, tennis racket, and an exercise video or a DVD. When planning the schedule for the trip, remember to include time for exercise. Often, business trips are packed with back-to-back meetings or presentations, leaving little time for either exercise or relaxation. Exercising is a known stress-reliever, thus it is beneficial to allot time for it. It sharpens one’s concentration and can help one be more productive. An out-of-the box approach could be to take the attendees of a meeting out for an exercise regimen. In such an informal environment, the outcome of the meeting could be more fruitful than otherwise. Of course, this way one can also get to maintain one’s exercise program. Using the traveling time to exercise can be a good way to get fit. People can wear walking shoes while traveling. If one is flying to one’s destination, one can walk within the airport terminal. While traveling by train, one can walk between the coaches occasionally. If one is driving, it is advisable to take frequent breaks to do some stretching exercises. It is important to listen to one’s body and heed the signs it gives. If the body is tired from the change in routine or jetlagged, it is advisable to rest. According to a study published in the journal Aviation, Space, and Environmental Medicine in 1983, flying across time zones causes fatigue, headache, weakness, irritability, as well as sleeplessness. Currently, research suggests that one can maintain one’s fitness level even by taking a week off from one’s regular exercise regime. So, the best thing to do is to strike a balance between one’s travel requirements and those of physical exercising. Wright, J. E., Vogel, J. A., Sampson, J. B., Knapik, J. J., Patton, J. F., & Daniels, W. L. (1983). Effects of travel across time zones (jet-lag) on exercise capacity and performance. Aviation, space, and environmental medicine. Reilly, T., Waterhouse, J., & Edwards, B. (2005). Jet lag and air travel: implications for performance. Clinics in sports medicine, 24(2), 367-380. Youngstedt, S. D., & O’connor, P. J. (1999). The influence of air travel on athletic performance. Sports Medicine, 28(3), 197-207.